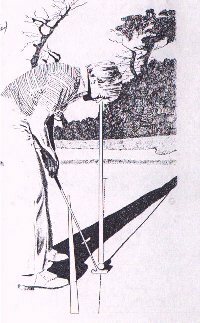 Having a straight and level gaze is more important than whether the eyes are positioned directly above the ball or slightly inside, and a reliable way to get the gaze straight and level is to "salute the dawn" with your saluting hand level with your pupils and then bend at address lowering your head towards the ball until the ball "rises" above the salute into vision like a dawning sun coming up over the horizon. Salute the dawn on the far sea horizon by positioning your saluting hand's fingers level and just beneath your two pupils. Then bend at address to the ball and wait until the ball "rises" above your salute and then stop bending. Regardless of whether your eyes are positioned vertically above the ball or inside the ball, this is a "straight ahead" gaze that will help you target accurately and in a way that optimizes your putting. What's This All About? Golf instruction chronically perpetuates the confusion over eye position and targeting by framing the discussion solely in terms of positioning the eyes. Conventional lore from the 1930-1970 era held that the eyes MUST be directly above the ball. During the 1970-1980 period, this changed somewhat in practice as green surfaces became smoother and faster and putting technique shifted from the hands to the shoulders. This resulted in a slightly different eye position for many, but not all, golfers, in which positioning the eyes slightly inside the ball was deemed acceptable. The conflict with the old lore was never really addressed or resolved. In the September 2002 issue of Golf Magazine, putter maker Scotty Cameron claims that the "best" putters on Tour today position their eyes slightly inside the ball. He doesn't offer any discussion about whether this is good or bad or how it affects targeting. What's missing in all this is an understanding of GAZE in the head-eye orienting system. The Eyes move, the Head Moves. As far as the brain is concerned, when you look about you are not getting a sense of where the eyes are in relation to a target, but where the eyes are, where the head is, and where the body as a whole is located in relation to the target. The NECK relates the head to the body, and the GAZE relates the eyes to the head. Fundamentally, your brain uses nerves to "read" these relations and build up an accurate "geometry" of where things are. The brain doesn't use math to do this, though; it just uses your experiences as a person who has lived and looked about and moved about for decades. A "straight ahead" gaze is one that directs the eye balls straight out of the face and head. Not sideways. Not uppish. Not downish. Straight out. A Pirate searching the ocean horizon for merchant shipping booty looks straight out of the face. By far, almost all golfers today do not use this gaze pattern, and instead peer somewhat down their cheeks when addressing a putt. I refer to this as the "reading gaze" since the eyes are angled down the cheeks the same way they are when reading a book. This head-eye relation causes a big problem when the golfer looks toward the target with a neck turn that rotates the head -- the line of sight will curl hard to the inside like a prison-yard search beam at night. The rotating lantern in a lighthouse aims straight out, not down. When the line of sight is made to curl by virtue of the neck turning the head, the only way to actually look along a straight line of the ground is either to turn the neck so the top of the head wanders back as the "look" progresses, the gaze continually shifts with corrective darts to get the line of sight back onto what you hope is the straight line, or a combination of the two. In any case, the golfer in this situation has to rely upon OTHER ways for sensing where the straight line actually lies along the ground, and not his targeting movements of head and eyes. Golfers using this flawed GAZE down the cheeks get poor geometry in their targeting from the address setup. This "bad info" confuses and complicates the targeting performed from behind the ball and disturbs the golfer's sense of the putt. Experienced golfers who are not aware of this flaw develop behaviors to deal with it, like ignoring the conflict or just not trying to rely upon good targeting from address. The reason why many golfers are happy to dart their eyes from the ball to the target and back, without even looking at the ground between the two, is because they don't have the proper head-eye gaze pattern to allow them to look straight along the ground accurately. A reasonably "flat" head and gaze that is nearly straight out of the face. Johnny Miller, 1976, when he was pretty darn good! showing a very flat head and a very straight gaze out of his face. Jim Flick 1979, showing a head turn to the target with Ferris Wheel eyes (straight gaze + flat head). Prior to about 1975, pro golfers swore by a "flat head" at address. Putting greats like Bob Rosburg, Billy Casper, Arnold Palmer, and many others preached this point in their articles and books. It just so happens that if you COMBINE a straight GAZE with eyes directly above the ball, you will have a "flat head" by necessity, with the chin and forehead about the same elevation. If you position the eyes inside the ball, you PHYSICALLY cannot combine a straight gaze and a flat head and look at the ball, and you will instead be forced to have the forehead tilted up slightly higher than the chin in order to keep the gaze straight. That's fine, but the two combinations to avoid are 1) eyes directly over the ball but gaze angled down the cheeks, AND 2) eyes slightly inside the ball but gaze angled down the cheeks. Either pattern guarantees a flawed perceptive process for targeting -- one that not only gives bad information, but also actively prevents the acquisition of better information. Setting the gaze straight out of the face avoids these problems. Positioning the head directly above the ball helps, too, but is not really essential for accurate geometry. Straight gaze + eyes over ball allows a "Ferris Wheel" look down the line. Straight gaze + eyes inside ball allows a "Tilt-a-Whirl" look down the line. Both patterns show a straight line along the ground. The "salute" sets the eyes in a plane that works with, not against, the head turn. So leveling your salute beneath the pupils and then bending to the ball PREVENTS employing a gaze directed down the cheeks. MAKE THIS PART OF YOUR GAME. This tip is not really just about putting. The same principle applies to ANY golf targeting situation at address. But for putting, it is one of the more important keys to getting your targeting from behind the ball (or elsewhere) on the same page with your targeting from beside the ball at address. Have you seen the oft-repeated tip to drop a golf-ball from your eyes at address? That relates only to the physical positioning of the eyes, and not to your gaze. Have you seen mirrors on the ground for putting? Ditto! While it's nice (and probably best) to have the eyes directly above the ball, it MORE IMPORTANT to have the GAZE straight out of your face!